3 COMPOUNDS Compounds are made up of two or more elements. Atoms of the elements are chemically bonded together. 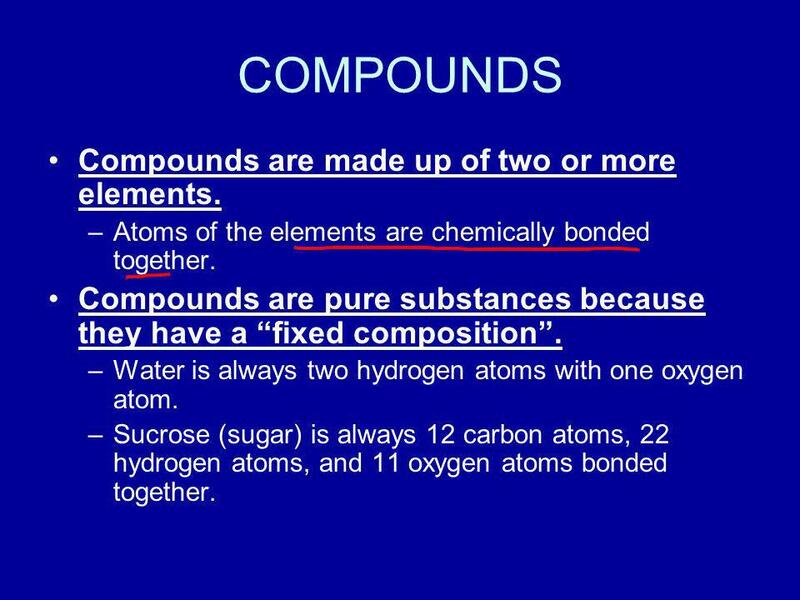 Compounds are pure substances because they have a “fixed composition”. Water is always two hydrogen atoms with one oxygen atom. Sucrose (sugar) is always 12 carbon atoms, 22 hydrogen atoms, and 11 oxygen atoms bonded together. 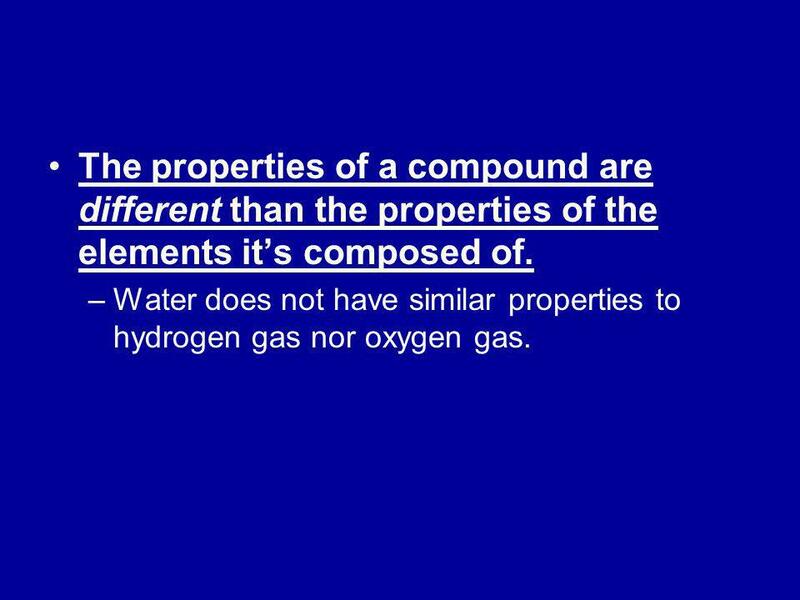 4 The properties of a compound are different than the properties of the elements it’s composed of. Water does not have similar properties to hydrogen gas nor oxygen gas. 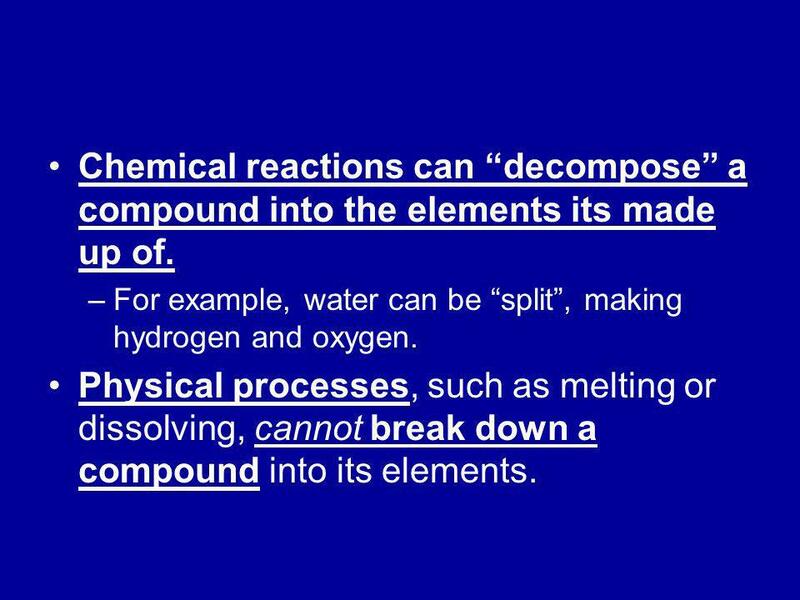 5 Chemical reactions can “decompose” a compound into the elements its made up of. For example, water can be “split”, making hydrogen and oxygen. 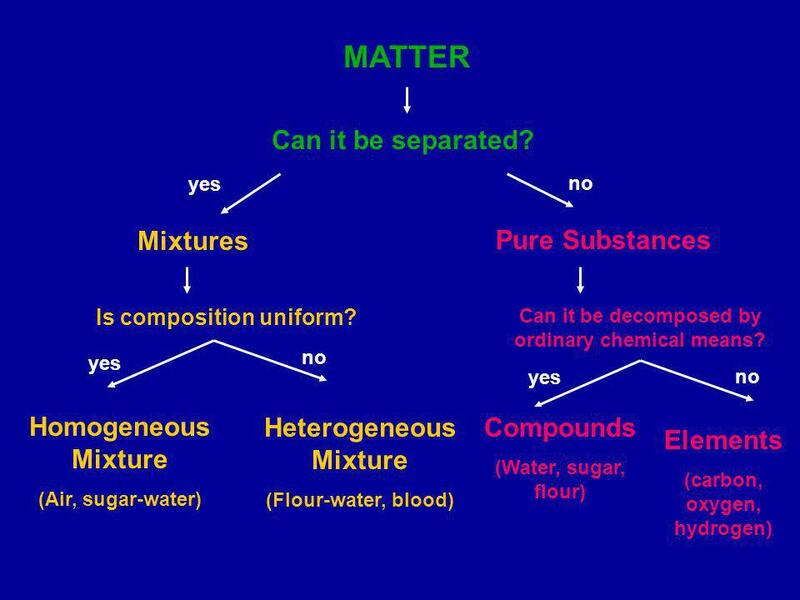 Physical processes, such as melting or dissolving, cannot break down a compound into its elements. 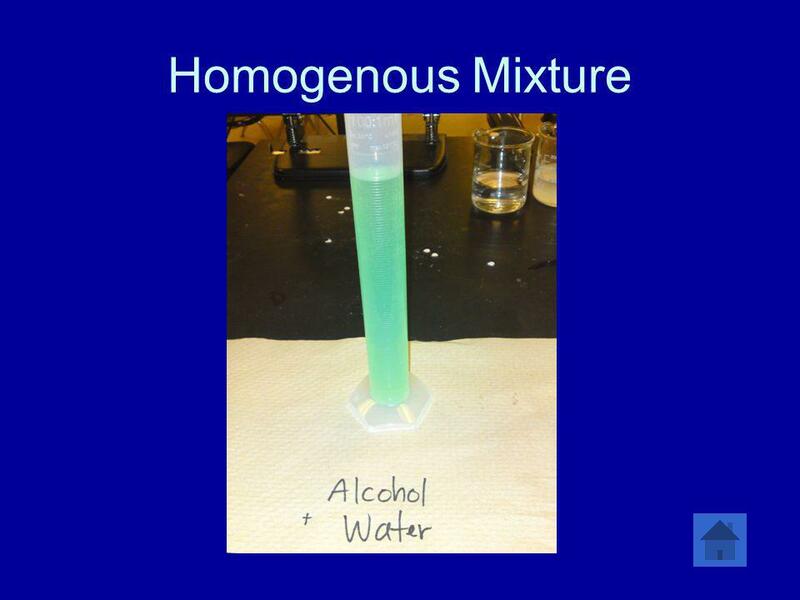 6 MIXTURES A mixture is a combination of 2 or more pure substances. The substances are physically combined. 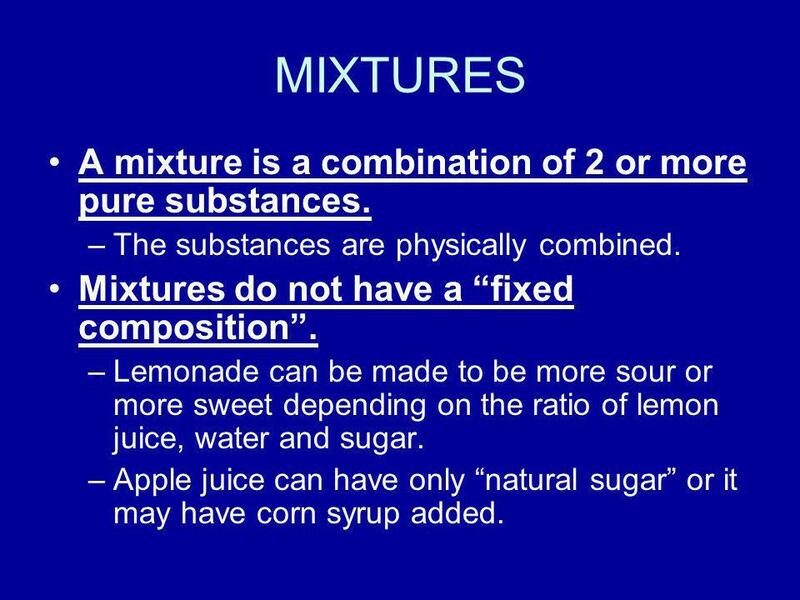 Mixtures do not have a “fixed composition”. Lemonade can be made to be more sour or more sweet depending on the ratio of lemon juice, water and sugar. Apple juice can have only “natural sugar” or it may have corn syrup added. 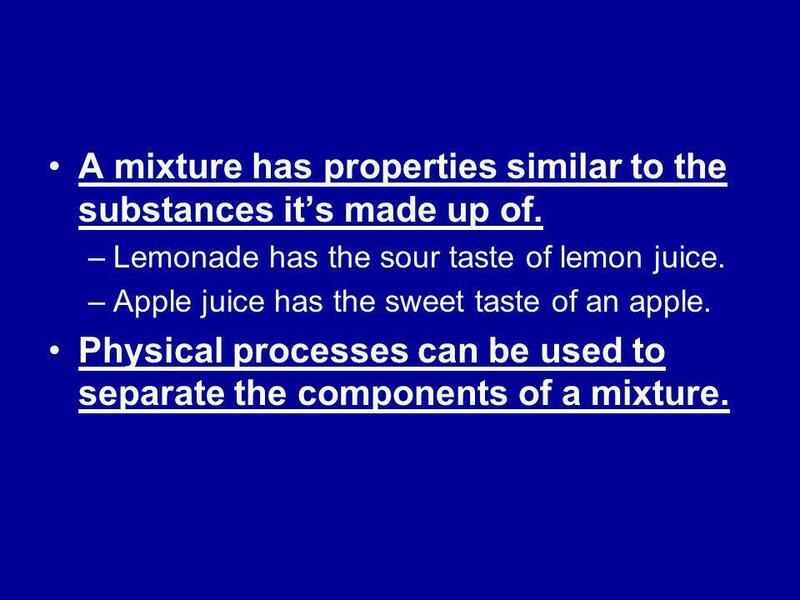 7 A mixture has properties similar to the substances it’s made up of. Lemonade has the sour taste of lemon juice. Apple juice has the sweet taste of an apple. 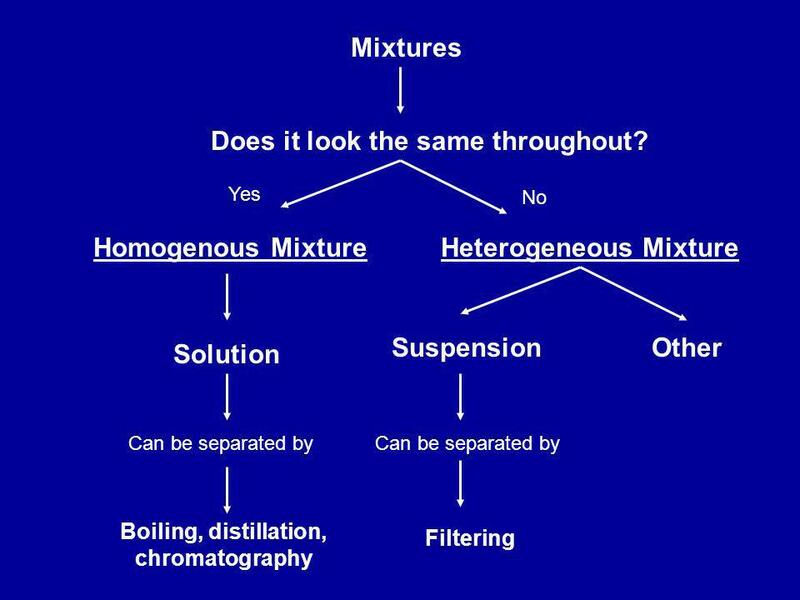 Physical processes can be used to separate the components of a mixture. 8 Time to Think! 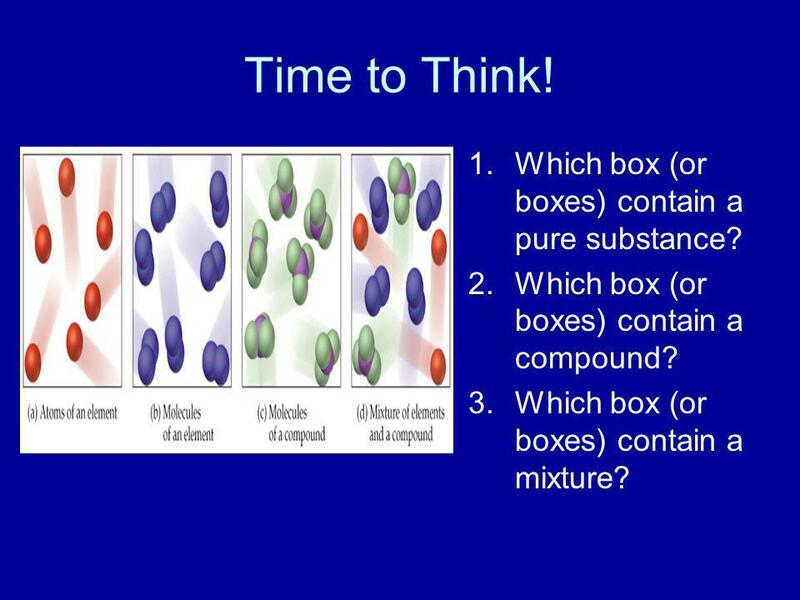 Which box (or boxes) contain a pure substance? Which box (or boxes) contain a compound? Which box (or boxes) contain a mixture? 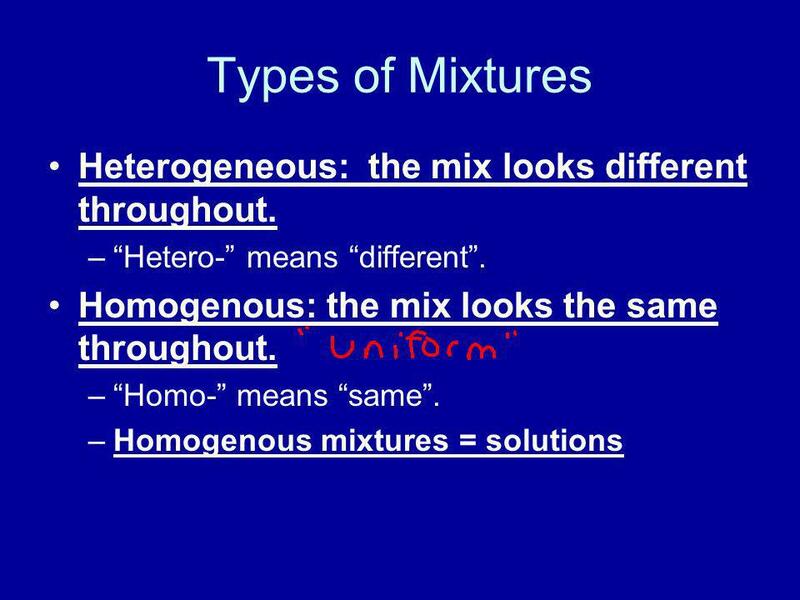 10 Types of Mixtures Heterogeneous: the mix looks different throughout. 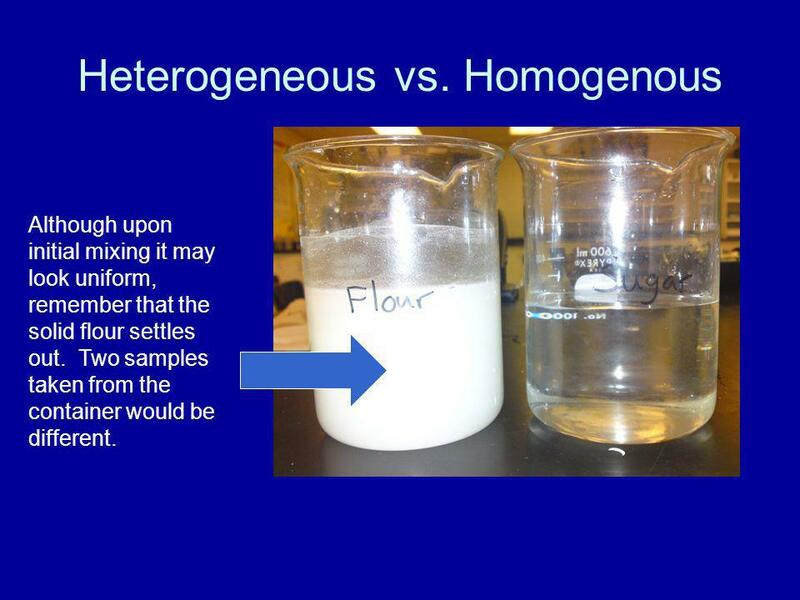 Although upon initial mixing it may look uniform, remember that the solid flour settles out. Two samples taken from the container would be different. 12 Does it look the same throughout? 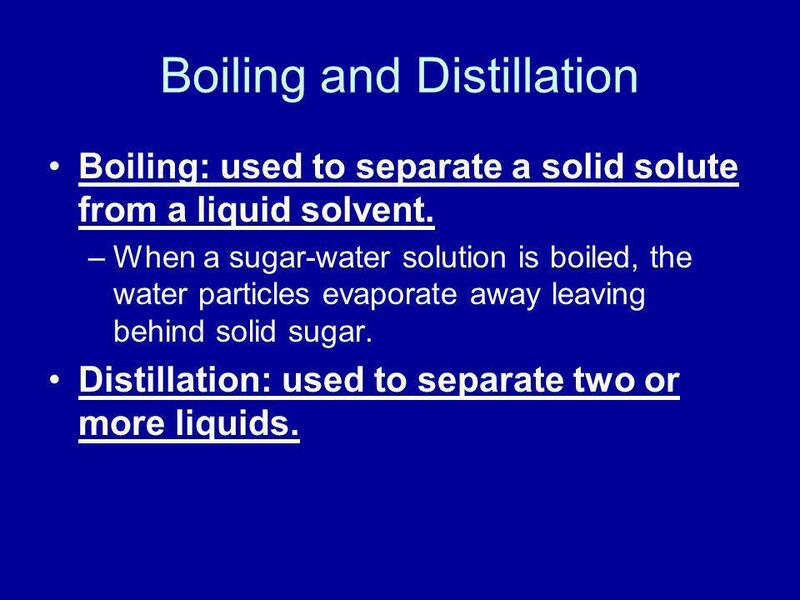 Boiling: used to separate a solid solute from a liquid solvent. 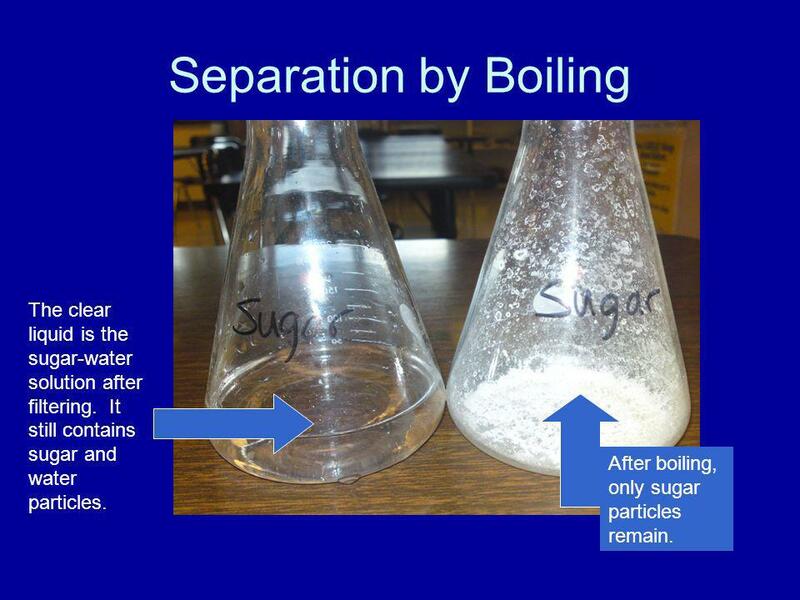 When a sugar-water solution is boiled, the water particles evaporate away leaving behind solid sugar. 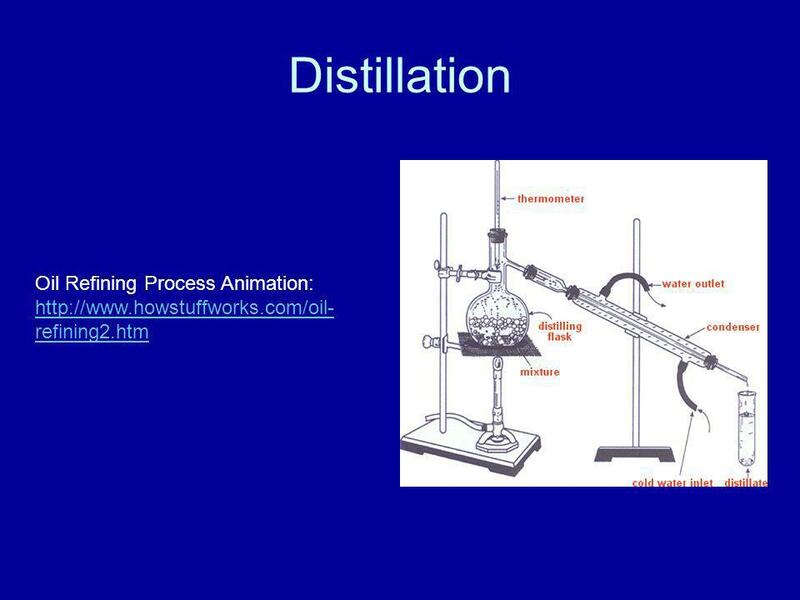 Distillation: used to separate two or more liquids. 14 Separation by Boiling The clear liquid is the sugar-water solution after filtering. It still contains sugar and water particles. After boiling, only sugar particles remain. 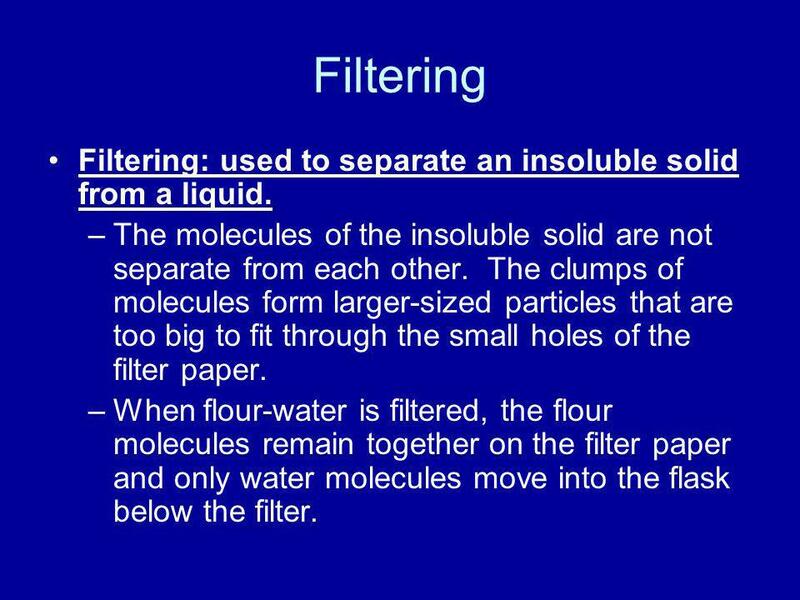 16 Filtering Filtering: used to separate an insoluble solid from a liquid. 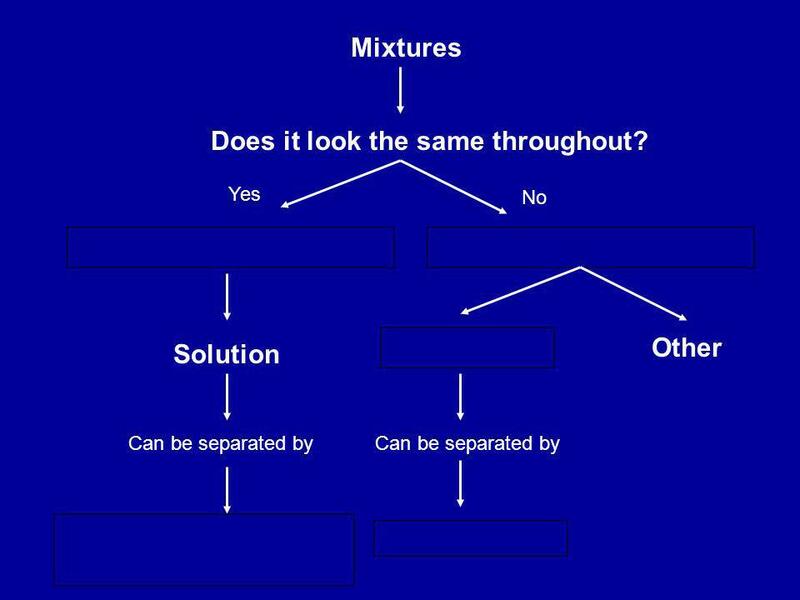 The molecules of the insoluble solid are not separate from each other. The clumps of molecules form larger-sized particles that are too big to fit through the small holes of the filter paper. 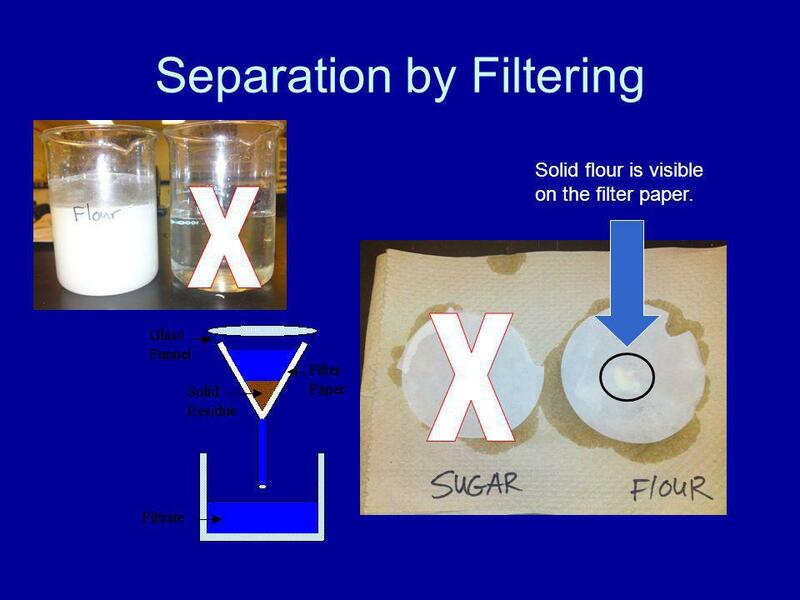 When flour-water is filtered, the flour molecules remain together on the filter paper and only water molecules move into the flask below the filter. 18 Time to Think! 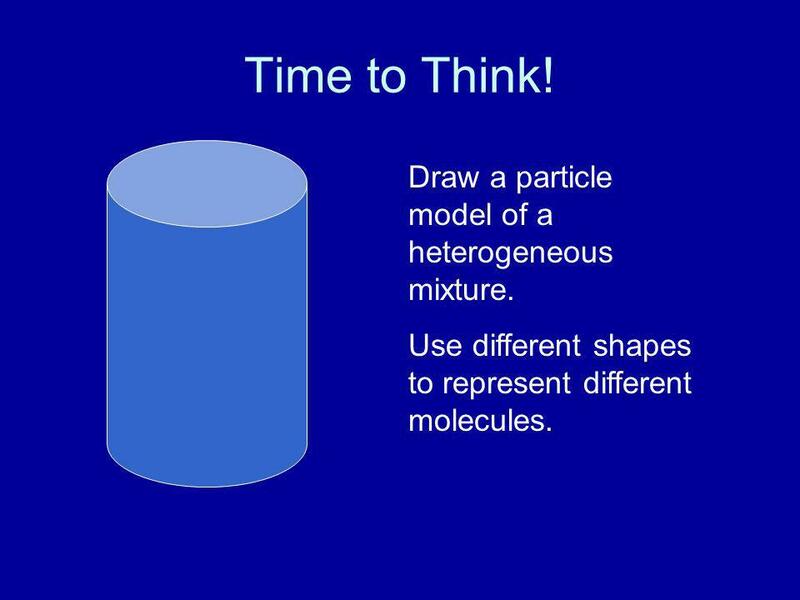 Draw a particle model of a heterogeneous mixture. Use different shapes to represent different molecules. 19 Time to Think! 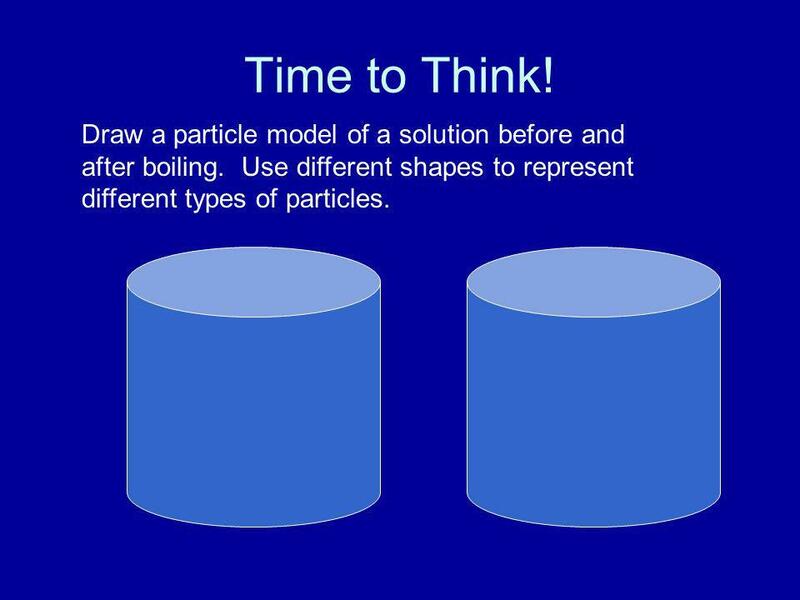 Draw a particle model of a solution before and after boiling. Use different shapes to represent different types of particles. 23 Does it look the same throughout? 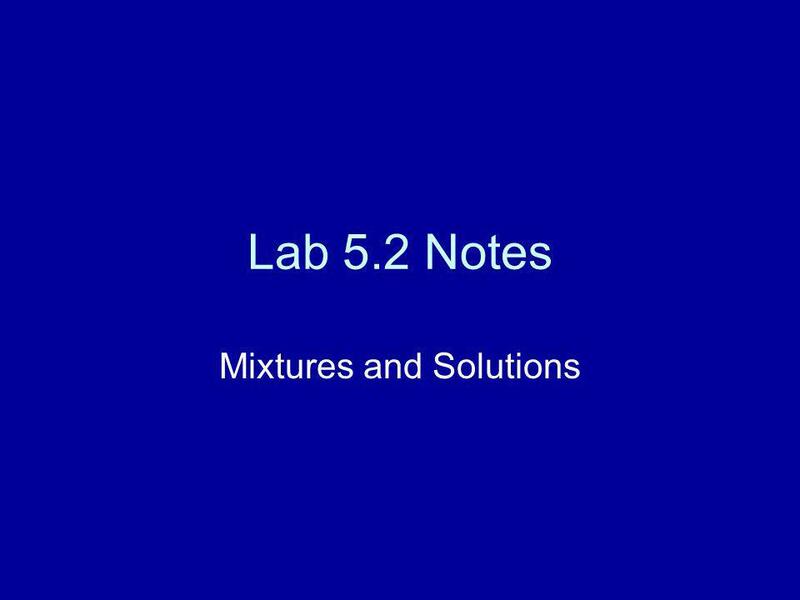 Download ppt "Mixtures and Solutions"
Spring The smallest part of matter is: a. Cell b. Particle c. Molecule d. Atom 2. To find information about elements: a. Look at a dictionary. Substances, Compounds & Mixtures How everything is put together. 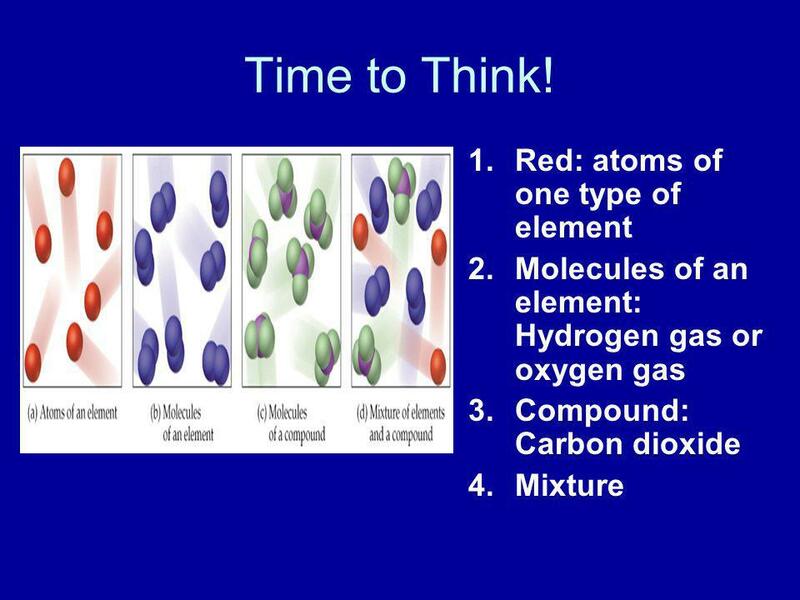 Atoms Elements Molecules Compounds Pure Substance Mixture Solution. 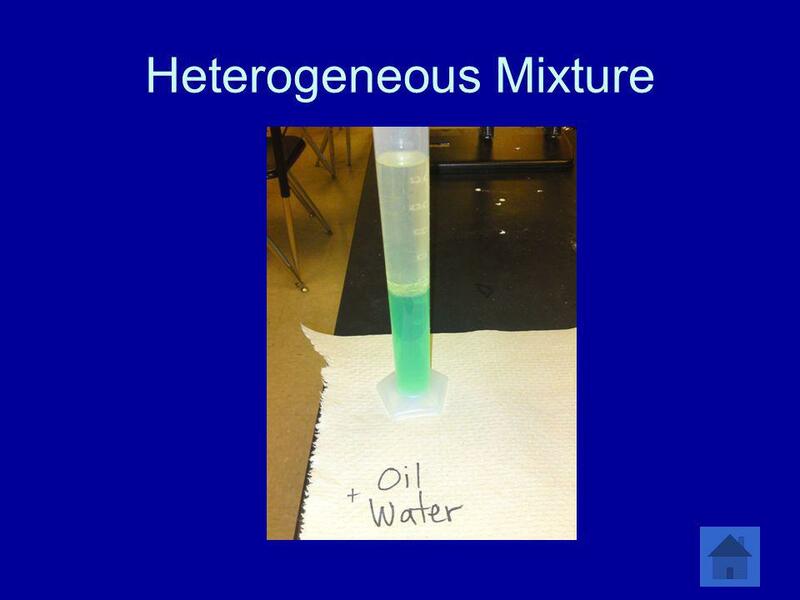 Substances and Mixtures!. 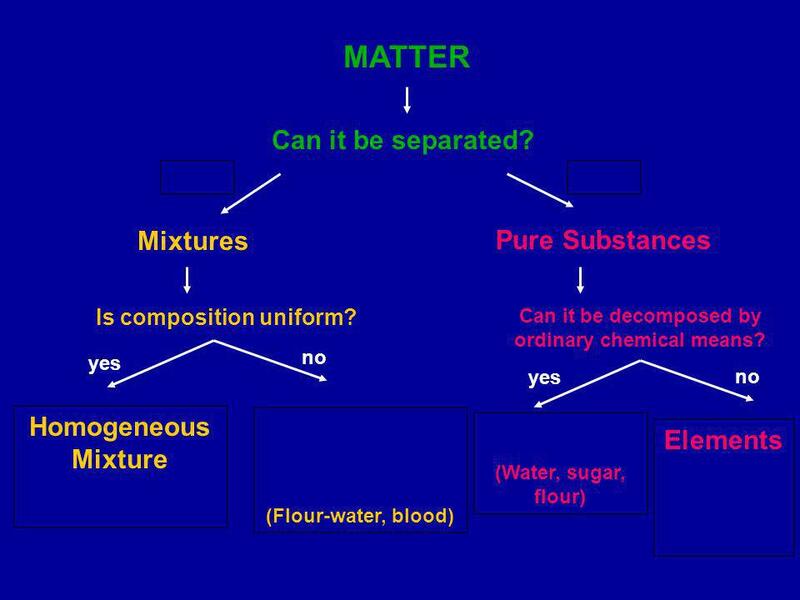 Substances:  Matter – everything that has mass and takes up space.  It can be classified by its physical properties.  One.